Née en 1956 à Nantes, l’auteure qui a débuté par des poèmes d’amour traduits en Anglais, continue sur sa lancée en publiant dès 2017 des romans inspirés d’histoires vraies. Born in 1956 in Nantes, the author, who began with love poems translated into English, continues her momentum by publishing novels inspired by true stories in 2017.
seeking through words and finding happiness in it! well expressed! Hello and thanks for dropping in to the beeseeker blog – I really appreciate you taking thetimne to track it down – and, hey – sky is a good choice. Hope to « see » you again soon: maybe here, maybe there. Thank you for visiting, Gys. I am always amazed by people who straddle two laguages – not merely speak but can write poetry in both. That is a gift – it provides a venue to literally bridge cultures and promote peace and harmony. Nice to meet you Gys! Thanks for your visits to my blog. Je vis au Pays de Galles, et je suis maintenant la suite de votre Blog. :). dear Gys, I visited Paris for three days in July of 1974…I was in training at the time to become a nun…I loved the time, short as it was…was only « allowed » to stand at the bottom of the Eiffel Tower…but viewed it all the same! I had heard about it since I was young. Notre Dame–Oh my–what can I say about the flying buttresses! Magnificent! I learned only a little French during my initiation into the Order. I live in the countryside, near Palmyra, WI, USA. Wisconsin has rolling hills, little farms, many lakes and a mixture of cultures and people. I am so honored that you visit my blog and leave comments–every writer loves those, yes?! May you have a pleasant weekend! You have a very romantic heart! I love your poetry! dear Gyselaine, I have nominated you for the SEMPER FIDELIS AWARD: Please go to my site to find it and what you need to do to accept the award. Merci! 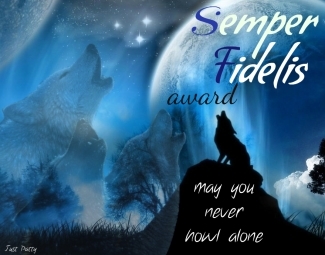 This description was written by Patty of http://petitemagique.wordpress.com: Semper Fidelis is Latin and means Always Loyal. Loyalty means the world to me. I am very loyal myself, but I’ve got major trust issues as well. And I think trust is very important if you are sharing so much of yourself with people you meet through the internet. So I am working on that! 🙂 Why the wolves? Because wolves have very strong ties with their pack. Like a family or a great group of friends. And I just love them! This award stands for the loyalty and love between friends. Nominate 5 bloggers who’s loyalty and friendship you value and you consider being part of your ‘pack of wolves’ on WordPress. Post something special for each one of your nominees and dedicate it to them. This can be a quote, saying, poem, picture, anything you think that would fit that person. I am very grateful to Patty of http://petitemagique.wordpress.com for her award to me! If you go to my site, you will find an image of the award…I do not seem to be able to copy and paste it to your blog. Sorry! Please accept this award! Merci beaucoup for LIKING my blog. I enjoyed reading your poems.